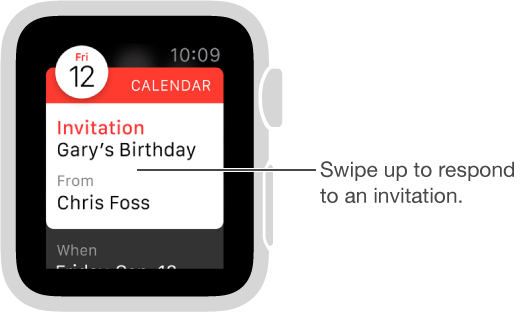 The Calendar app on Apple Watch shows events you’ve scheduled or been invited to today and for the next week. 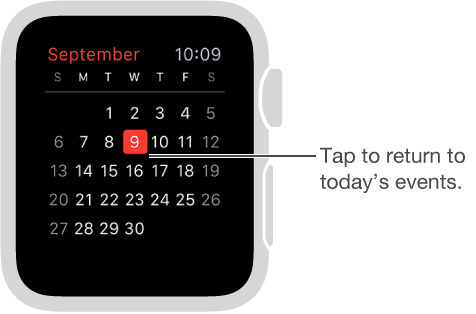 Apple Watch shows events for all calendars you use on your iPhone. View your calendar. 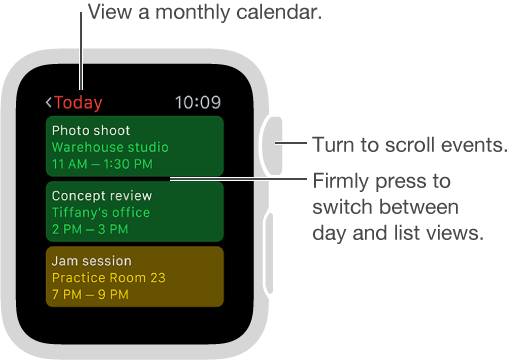 Open Calendar from the Home screen, or swipe up on the watch face, swipe to the Calendar glance, then tap. You can also tap today’s date on your watch face if you’ve added the calendar to the face. Review today’s events. Open Calendar , then turn the Digital Crown to scroll. Swipe right on today’s timeline (Day view) to jump to the current time. To see event details, including time, location, invitee status, and notes, tap the event. Switch between the daily timeline and a single list of events. Firmly press the display while viewing a daily calendar, then tap List or Day. View a different day. In Day view, swipe left on today’s calendar to see the next day. Swipe right to go back. (You can’t see any day before today, or more than seven days total.) To jump back to the current day and time, firmly press the display, then tap Today. In List view, just turn the Digital Crown. See a full month calendar. Tap < in the upper left of any daily calendar. Tap the monthly calendar to return to Day view. Add or modify an event. Switch to the Calendar app on iPhone, then add the event there. If you’re looking at your calendar on Apple Watch, just wake iPhone and swipe up on the Calendar icon in the lower-left corner of the Lock screen to open Calendar. Display the date or an upcoming event on the watch face. You can add some combination of day and date to many of the watch faces: for example, Modular, Color, Utility, Simple, or Chronograph. The Modular, Chronograph, and Mickey Mouse faces can show the next upcoming event. Firmly press the display while viewing the watch face, swipe to a face, then tap Customize. Respond to an invitation. If you see the invitation when it arrives, just swipe (or turn the Digital Crown to scroll) to the bottom of the notification, then tap Accept, Maybe, or Decline. If you discover the notification later, tap it in your list of notifications, then scroll and respond. If you’re already in the Calendar app, just tap the event to respond. Contact an event organizer. To email the event organizer, firmly press the display while you’re looking at the event details. To send a voice message or call, tap the organizer’s name in the event details. Time to leave. If the event includes a location, you’ll get a “leave now” alert on Apple Watch based on estimated travel time and traffic conditions. To adjust, open the Calendar app on iPhone, tap the event, then tap Alert. Get directions to an event. See Get directions. Adjust settings. Open the Apple Watch app on iPhone, tap My Watch, then tap Calendar.